I had a pager as a teen. If I was gone for long periods of time, my poor parents would send me their phone number, which meant I was supposed to call home ASAP. Sometimes, I’d make the effort to call them back, but most of the time I’d ignore the message. When I did finally go home, I’d just deny ever getting the page or I’d come up with some other, more creative excuse. These days, the technology used to keep tabs on teens has evolved. Tech-savvy parents are surveillance-obsessed, following their kids’ every moves via social media feeds or smart-phone tracking apps like Find My Friends. 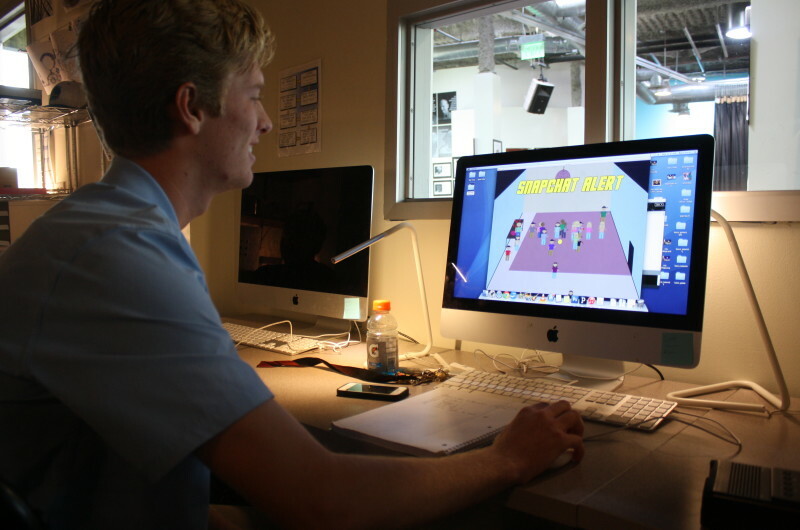 For the kids being watched, it’s no fun, said Ryan Hurst, a senior at High Tech High Media Arts in Point Loma. Hurst is one of 50 seniors at high Tech High who’ve created multimedia art projects that explore what it’s like to be a modern teenager. The students’ projects will be presented to the public at an event at the school on Tuesday, May 10 at 5:30 p.m.
Hurst pulled up a computer game he coded and illustrated with the help of his partner. It’s set at a party, and the user has to click on Snapchat alerts before they get sent out by the crowd of teens at the party and incriminating evidence makes its way to parents. Players are meant to feel the nagging digital dilemma that today’s teens experience. Hurst said he often feels like he can’t make any mistakes without a digital footprint of them eventually ending up in front of his parents. Hurst said parents should ease up a bit and let their kids mess up because the constant surveillance causes a ton of stress. Stress and its relationship to technology ended up being a recurring theme in a lot of the students’ projects. Noble partnered with English teacher Rachel Nichols for what they’ve dubbed “The Making of a Modern Teen” project. While some of the teens explore concepts like bullying and beauty, the vast majority of the projects relate to the impact of technology on their personal lives. For many, the project ended up being therapeutic. A few of the teens I talked to said they realized how important it is to turn technology off and take a break every now and then. Kayla Murphy and Chloe Remley’s project is focused on stress — both its biological effects on the body and its environmental causes. One of the games they created shows a scene of a home. The screen quickly fills up with a barrage of text messages, college applications, calendar task reminders and more. They both know they should work in more downtime to cut down on stress, but they said it’s difficult to disconnect. “Finding time just to relax and rest is super hard,” Remley said.